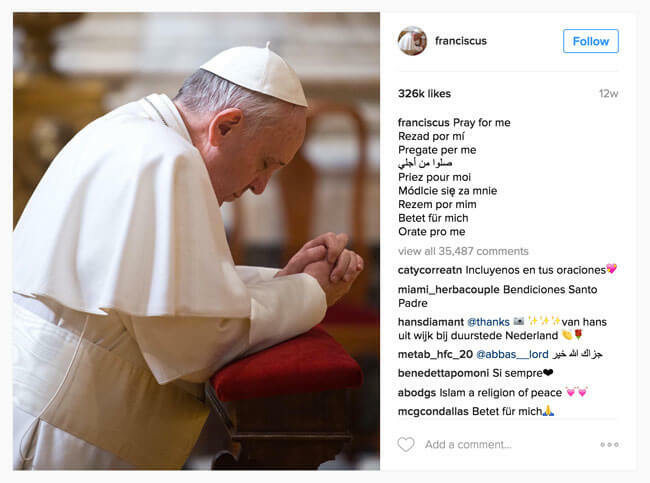 You may have seen Pope Francis’ Instagram debut back in 2016 and wondered how he does it: 326,000 likes on his first ever Instagram post. Already hitting it home with the Instagram captions! But unless you plan on becoming the Pope, it’s probably not going to be this easy right off the bat. So instead, we recommend you take another look at what your brand can do with your Instagram content to attract optimal engagement. And here’s a big one: assess how you use Instagram captions. Captions are often neglected when composing a top-notch Instagram post. In a world of filters and hashtags, it can be all too easy to forget that text plays an important role. We’ve said it before but it’s worth repeating: Text matters more than you might think on a social medium devoted to pictures. The Pope’s post above has a simple message that really appeals to his target audience – using different languages means that he’s extending his reach into his audience base. It shows he knows who he’s talking to! 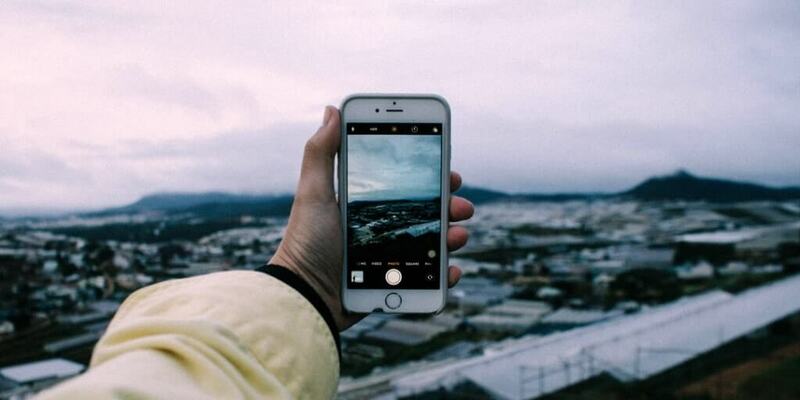 With that said, we’ve collected 6 tips for creating the perfect Instagram captions. Focusing on how to make your captions stand out without clouding your message – you can find it all here. Let’s get to it! A must for every kind of marketing, including Instagram marketing, is to make sure you do your homework and research your target market. Find users whose interests match yours, and you’ll reap long-term rewards in increased user engagement. Understanding your market means that you’re spending time creating content that will actually speak to them. This can also mean relating to your demographic on social issues and just understanding who they are and what they care about. And your captions are an important place for you to express your message. Use this space to start a dialogue with your customers. Then remember to respond to them when they answer back! Instagrammers love to see that brands have taken the time to answer questions and concerns on Instagram…that is what the platform was made for after all! Notice how the social media managers over at Chipotle respond directly to comments – also signing off each message so they know that it was Gabs (in this case) who got back to them. This really humanizes the brand, giving people the feeling that they’re interacting with a person rather than a company. Keep your captions short where possible. Sprout Social names the ideal caption length as 138-150 characters. Some even claim shorter is better! If you want to let the picture do all the talking and have no caption, it’s always an option. Your caption should add value to your content, so if it doesn’t then maybe it’s best to go without. Minimalism works in select cases, and if your picture is particularly captivating or puts across a specific message. As one Instagrammer puts it, ‘brevity is king’. (Though I’m a fan of at least something – even if it’s just an emoji! This post by Gap is short, sweet, and to the point, while still giving helpful information about the product! Capitalizing on a normal gripe of jeans – they lose their color and start to sag after too much use – this caption let’s us know that we have nothing to worry about with these pants. If you do have to use a longer caption, try breaking it up into smaller, scannable lines. If it fits your company’s style and image, consider adding in the occasional emoji to help compress that caption into something shorter (but more on that in Tip 4). Always remember though, if you can get your point across in a snappy caption, you’re winning at Instagram. You can also use your caption as an opportunity to credit your source – this is great if you’re utilizing a User Generated Content strategy! Instagram and apps like Everypost are great for helping you cross-post on other social media, boosting the combined impact of your posts. However, bear in mind that your perfect caption needs to be optimized for all the media you use simultaneously. For example, don’t use Instagram usernames when cross-posting to Facebook – they won’t link back to the Instagram users and therefore become redundant. Filling your captions with wall-to-wall blue text can turn a good post into an eyesore, so cut down on unnecessary spam hashtags. If you still have a long list of relevant hashtags (it happens), consider separating your tags from the rest of your text. A great way to do this is to place them in a separate comment, leaving your caption free to be a small, easily legible slice of black text. A word to the wise – unless your company already has a large following and has hosted many successful events, don’t fall into the trap of using event-specific hashtags. By definition, they can’t tap into any broader Instagram trend or be easily found through broader searches. As well as thinking about hashtag use in your Instagram captions, remember that over 50% of the text on Instagram contains emojis: they’re everywhere. It helps that a wider variety of emojis than the basic smiles and frowns are now more widely used – you can take advantage of this to summarise more complex ideas. You can even use emoji hashtags as an effective way to summarise the mood and tone of your post whilst keeping the perfect caption as short as possible. 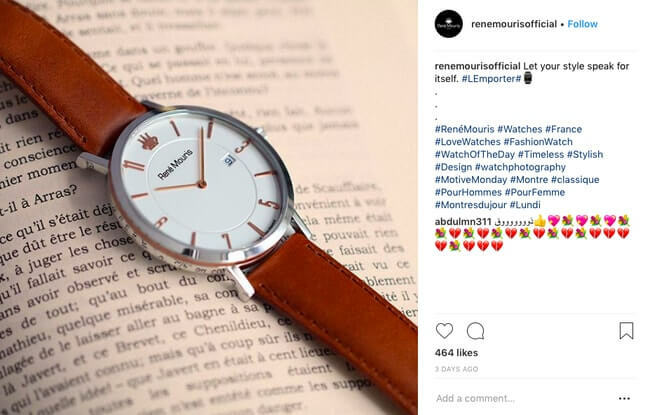 The post shown below is by René Mouris, a premium watch brand, who used a hashtagged watch emoji to embody what they sell. Notice how they separate their caption with the majority of their hashtags with the use of punctuation. This is another useful tactic to ensure that your caption doesn’t look overcrowded with blue hashtags. Whatever you decide to do, think about how your caption will come across visually. People are more likely to read it if its short and simple, with a little emoji fun! Bonus: Step-by-Step guide to planning your marketing strategy! Hootsuite gave us a valuable lesson and reminder: social media is not meant for advertising but as a way to share with others. This means that telling the story behind a photo can make it far more engaging. A user can become far more engaged with an image – taking time to stop, consider and enjoy it – because the caption showed them why they are looking at something special. Think about how music fans enjoy ‘rockumentaries’ showing how their favourite album was made (‘Funky Monks’ for the Red Hot Chili Peppers, anyone? ), or director’s commentary for famous films. If you decide to tell the story behind a post and multiply its value, you should do so using a signature style of some kind. Gimmicks, inside jokes, personality, whatever you want to call it: having repeated structures gives you parameters to work with when writing captions. And it gives your brand a unique voice that your followers can understand and enjoy, as if you were one of their friends with a quirky personality. Wits and puns are a good way to get such a signature style started and draw in new users with a caption. Someone once said that ‘cleverness is next to godliness on social media’. What were they referring to? Mainly the use of puns, word-play and general wittiness to gain attention online. There’s a reason why memes are so popular! They’re short, smart, and funny pieces of text and image that people can relate to. And this is a technique which works brilliantly to create short, memorable Instagram captions. They use a signature style of humour in their Instagram content and captions, which they’ve become known for. It’s silly but fun – and their followers love it. If you can manage to commit at the beginning to a specific Instagram caption tone, you’ll surely reap the rewards further down the line when your customers identify with this new personality that you’ve created. They’re always posting content that plays with fruit (as they are a smoothie brand!) and their captions help humanize the brand. Plus, all users are more likely to share a post with puns and general wit. Denny’s Diner has recently made a name for itself on social as a brand with a very specific brand personality – and a lot of this hangs on the captions! They’ve committed to a sort of alt-comdey style that their followers love. Even if it’s not your style of humor, you have to admit that it really sets them apart, which is a big deal for brands on Instagram. They masterfully make out-of-this-world jokes that have a lot of people wondering.. who does their social media marketing?? Because we want to meet them. This shows you that when you commit to a personality and understand your audience, Instagram captions are an amazing opportunity to set your brand apart from the rest. If you’re struggling for ideas, think of your caption like a tabloid newspaper headline and use that to help you create something short and memorable. Developing your own unique style or repeated gimmick will both appeal to followers and make this a lot easier for you to repeat. Innocent and Denny’s don’t just use this silly, joking tone on these posts – they use it across social media and further as the brand personality! Asking questions when creating the perfect caption is a tried-and-tested way to engage with your users, and it rarely fails. Don’t just ask any old question: use leading or rhetorical questions to both engage your follower’s attention and give them an opportunity for dialogue with you. This technique works especially well if you already have a strong, highly engaged fan-base, who you can ask for help or advice. Everyone loves to share their two cents and many will comment with an opinion! An open-ended question which is personal to your followers like Newcastle University’s example below is always a winner for user engagement. Combine this Tip with your research from Tip 1 to make sure your question is relevant and you have a winning formula for the perfect caption (just don’t overuse it). It may not be the first thing you think about when it comes to Instagram, but correct spelling, punctuation, and grammar have an important part to play in good caption-making. Slang and abbreviations can be a good option when used sparingly and with a relevant target group. They can help keep your caption short and accessible but make sure your caption is also legible, simple and easy to understand. Just don’t take too many attempts at slang, local customs or being ‘edgy’. We all cringe when we see a post on Instagram that is in poor taste or trying way too hard. We can all think of marketing campaigns which backfired because marketers missed the mark such as American Apparel’s tasteless 20% ‘Hurricane Sandy’ sale, promoted on social media. If a quality image makes someone stop and think, the perfect caption would offer them more, and it needs to be well-checked for spelling and grammar in order to do so. When creating the perfect caption on Instagram for your company, just remember to go over these points. Once you’ve researched what your followers want to see, create something short and sweet to avoid losing the user’s attention. Be sure to consider how your caption looks on other social media if cross-posting and be careful with how many hashtags you use (if you don’t put them separately in the comments or separate with a punctuation trick). While we’re talking about hashtags, tasteful combinations of emojis are often a good idea. Use these tools to tell a story in your caption and/or ask an open-ended question to increase engagement. If you can also manage a little wordplay and some wit (all spell-checked and appropriate, of course), then you’re set to have the perfect caption for each image with room for a little eye-catching controversy if need be. All of these tips are a great way to engage with your users, but remember: a clear call to action is what will make them, well, take action. A useful way to drive users to your business page is to remain users of the link in your bio – don’t be afraid to tell them where they can find your products! Got any examples of Instagram captions that you’re obsessed with? Let us know in the comments below!